Wahoo I have returned. The last few weeks have been a big ball of business where every thing has taken a back seat. My eyebrows have turned into overgrown caterpillars, my nails are chipped, broken and tatty and my dirty washing basket is bursting at the seams, but not to worry today is about getting back on top of life. Yesterday I said goodbye to my full time students for a week and now I have a few days of quietness to look forward to. I felt like a teenager this morning because I didn't get out of bed until 10:30 and I am still currently in my PJ's and feel completely guilt free. Now to the important part, my outfit below. 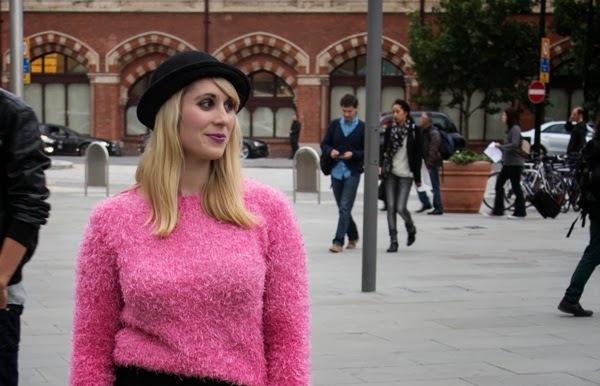 This jumper is soft, snuggly and so bright it's perfect for those dull dingy days where the weather wants to do everything it possibly can to depress you. At £10 how can you say no. I have paired it with my trusty American Apparel disco leggings, cut out boots Glenn got me for my birthday and a bowler hat. Those of you that follow my Facebook page would have also seen that went very quiet, but not to worry I have lots of new shops, useful blog posts and tips scheduled for the week so make sure you look out for them. I am attending my friends Photoshop workshop tomorrow (if you want to attend it's not to late to buy a place here and it's only £75 for the day so a bargain) so I am hoping I will be able to get more creative with my pictures. I also have an exciting halloween themed shoot with him next week when I am going to experiment with creating some eerie themed pictures. Hope everyone is enjoying there weekend. Beautiful retro flare in this outfit. It reminds me so much of the 80's. I love that sweater and those shoes rock!